Next-level lessons — Interactive whiteboards start where traditional lessons leave off, turning ho-hum classes into engaging multimedia presentations. With most of today's students eagerly embracing screen technologies, you can expect improved interaction, excitement, and active rather than passive participation. Interactive whiteboards draw students into the lesson for improved understanding and retention of daily lessons. Integration — You won't need professional tech support to integrate your interactive whiteboards with your existing technology. Connect and collaborate using laptops, tablets, smartphones or USB drives without additional software or complicated set-up processes. Personalization — Encourage student pride by showcasing individual projects and achievements using your interactive whiteboards. Students can use their finger or an electronic pen to move content, write, and draw directly on the screen or via laptops and mobile devices. Leave the classroom behind — Why stay in town when you can take your entire class to the rainforests of the Amazon? Interactive whiteboards make field trips to every corner of the globe safe, fun, and educational and without straining the budget. No permission slips, chaperones, or hiking boots required! Document student progress — Interactive whiteboards make documenting student progress easier and more intuitive. 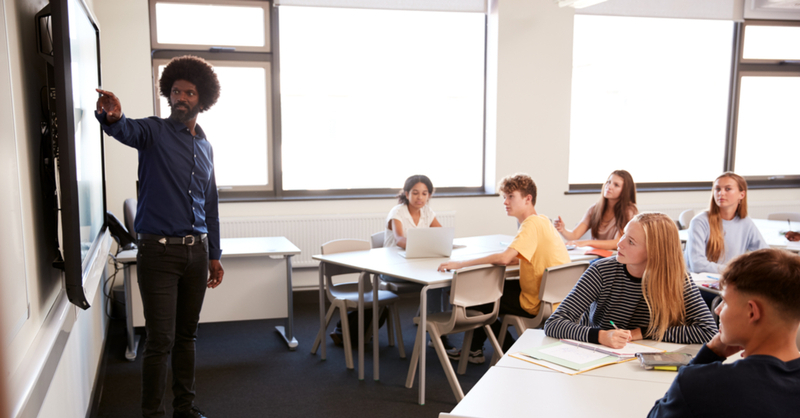 Teach to all learning styles — Interactive whiteboards allow for greater teaching flexibility, turning static lessons into dynamic presentations that appeal to a wide variety of students with diverse learning styles. Save lessons — Save your lessons for review purposes, to assist substitute teachers with lesson preparation, or to help absent students catch up on missed lessons. Is your school district ready unleash the power of digital learning with interactive whiteboards? Contact us at American Business Equipment to learn more today!